Returning to the GPAC stage for an encore performance is the extraordinary show that brings together the art and music of the guitar for a sensory feast for the soul. 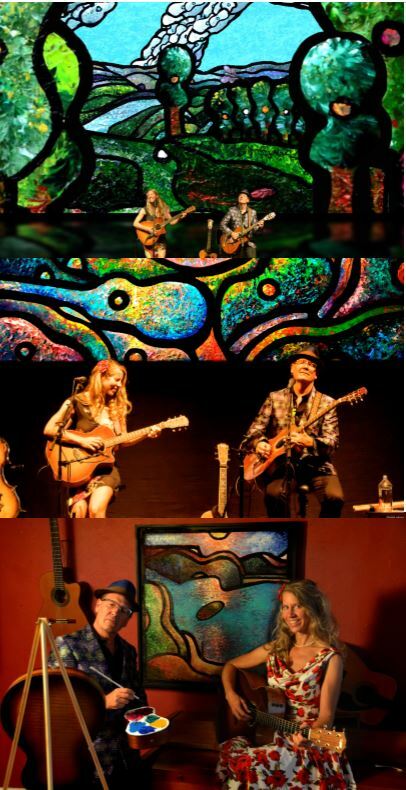 Performing fiery Spanish guitar pieces like "Malaguena" to the gorgeous vocal harmonies of "Sounds of Silence" this duo takes the art of guitars to another dimension with the exciting new animated painting concert experience. A colorful backdrop of lush vibrant painted landscapes based on the guitar theme flows thru the concert. Moving in 3D guitar birds fly through guitar mountains and over guitar rivers, cities and oceans. The paintings come alive with music in this unforgettable surround art experience. Master guitarist Bruce Hecksel and singer-songwriter Julie Patchouli blend music from their two musical projects Terra Guitarra and Patchouli. Terra Guitarra is reviewed as "one of the top nuevo-flamenco groups in the world" - Zone Music Reporter. They have four top 5 internationally charting albums including 2017 release "Of Sea & Stars" Winner of the "Best Instrumental Album of the Year" Award which was also #1 on OneWorldMusicRadio UK charts. Folk festival favorite Patchouli features Julie's sparkling lead vocals, beautiful duets and award winning compositions. The Chicago Tribune says the duo's "songs about harmony & healing inspire the human spirit".